Listen Technologies' new Stationary RF systems were designed as a solution for system integrators, contractors, and consultants working with venues seeking assistive listening for either legislative compliance or to meet the personal listening needs of their customers. 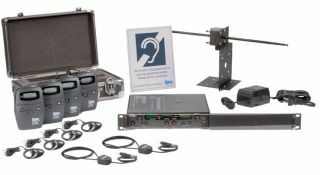 Listen Technologies new Stationary RF systems for assistive listening. The new assistive technology is available in a range of configurations and offers a competitive price point to installers and high quality sound (with 20 dB less hiss than competitive products from other brands). The systems are also backed by an extensive warranty and Listen Technologies’ acclaimed customer service/support. All systems include all necessary components for assistive listening and legislative compliance. Other features include the SQ Super Quiet Companding Switch, which provides the highest audio quality available (20 dB less hiss than any competitor) when enabled. SQ can be disabled for compatibility with other assistive listening equipment. The Stationary RF systems have 57 channels offering maximum flexibility, with capabilities for language interpretation and assurance in finding a clear channel. Look & Listen display on select receivers (Premier and Ultimate systems) allows intuitive use, managing, and programming. Lastly, options for applications range from simple use in smaller venues to professional installation in larger venues and longer range of up to 3,000 ft.